The All American Jr Show was held in Harrington, DE this year and the turn out was spectacular. The fair grounds, the DE hospitality, the camp sites, the youth exhibitors with their families, the weather, and the All American Jr Show staffers made for a great weekend. This show is known for its total family involvement and this year was no different. The weekend started on Thursday by a beach trip to Rehoboth with many site seeing options or just walking the board walk and enjoying the beach and the tax free shopping. Friday morning started off with registration, gift bags and then showmanship. There was plenty to do with the skill-a-thon, 3 on 3 basketball, lamb camp, judging contest, promotional contests, fleece show plus the pizza party and the crab feast. The basket raffle raised approximately $2900 for next years All American. There was over 1100 head of sheep and 200+ kids with 16 breeds of sheep being represented. This was the 2nd year that Romneys have participated in the All American Jr Show. The Romneys had 60 head of sheep with 14 exhibitors. The yearling ewe class filled the ring with 18 head of sheep, it was something to see. The quality of sheep was deep which made for some stiff but friendly competition. Many of our Romney youth showed all day by showing other breeds with their friends or had a second breed of their own, either way it was a long but fun day. The Romney exhibitors ranged in age from 3 to 21, with the older Jrs helping the younger ones. For complete results visit the All American Jr Website with a partial listing appearing in the Ramblings. Next year All American Jr Show will be in Des Moines, IA, July 6th thru the 8th……hope to see you there with your Romneys & kids in tow! Put it in your calendar now and make it a family excursion. 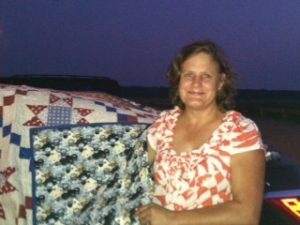 Lori Shea of Columbus, NJ won the All American Jr Show quilt raffle. Proceeds from quilt raffle paid for the Romney portion of the show. Thanks to everyone who purchased tickets.